Gary McAllister was born 25th December 1964 in Motherwell and after initially playing for his hometown team he went on to have an extremely successful career of almost twenty years with Leicester City, Leeds United, Coventry City and Liverpool and gained fifty-seven full Caps for Scotland as well as two 'B' and one Under-Twenty-one cap. He won a Scottish League Division Championship medal with Motherwell in 1984-85, a Football League Championship medal in 1991-92, a Charity Shield Winners' medal in 1992-93 and a League Cup Final losers' medal in 1995-96 with Leeds United and A League Cup Winners' medal, FA Cup Winners' medal and a UEFA Cup Winners' medal in 2000-01 followed by a Charity Shield Winners' medal and a UEFA Super Cup Winners' medal in 2001-02 while at Liverpool. He was inducted into the Scottish Hall of Fame and awarded the MBE in 2001. He scored one hundred and forty-five goals in eight hundred and forty-one in all club games in his career. After leaving Liverpool he rejoined Coventry City on 5th July 2002 and was appointed Player/Manager. He made fifty-five League appearances and scored ten goals for the Sky Blues, but he did not have sustained success as a Manager and narrowly avoided relegation inhis first season. He remained with Coventry until he left to care for his wife, who had breast cancer, on 11th December 2003. Unfortunately her battle was lost and she passed away on 3rd March 2006. He remained out of football and football management until he was approached by Ken Bates to replace Dennis Wise and he took up his new challenge on 29th January 2008 with a temporary contract until the end of the season. Leeds were sixth in Division One when Wise left and under the temporary stewardship of Glyn Williams, and Unitedslumped to eighth after McAllister's first game in charge against Tranmere Rovers finished in defeat. He did not have the best of starts and stuttered to three consecutive 1-1 League draws at Northampton Town and then at home to Nottingham Forest and Crewe Alexandra as United fell to ninth spot, five points adrift of the sixth play-off spot but with a game in hand. McAllister had taken a long time to get Leeds playing in the style he expected and their style and system became more free flowing and it paid it's first dividend as Leeds secured full points for the first time under his managership with a lone goal victory at Swindon Town. This eased them one position and three points closer to their target. An easy home victory over relegation candidates Bournemouth saw United up to seventh, just one pointfrom sixth spot, before unexpectedly losing at home to Cheltenham Town and drawing 3-3 at Port Vale, both teams in the relegation mire. This saw them at tenth, although just two points adrift from sixth place. After a 0-0 draw at Brighton and Hove Albion United won surprisingly and fortunately at Doncaster Rovers, which prompted Ken Bates to offer him a twelve month contract on 3rd April 2008, and followed this up with a 2-0 victory at Leyton Orient to get back on track and into contention in sixth place and two points and a game in hand on the seventh club. A 3-2 home victory over high-flyers Carlisle United was followed by an unexpected loss at Huddersfield Town in a spiteful game which saw two red cards and seven yellows. This saw United firmly entrenched in sixth spot with four points to spare over the seventh team. Two away wins, at Millwall by 2-0 and at Yeovil Town by the solitary goal saw a play-off spot assured with United still six points behind second placed Carlisle United for the automatic promotion second place. With United winning their final home match against the relegated Gillingham by 2-1 they moved into fifth spot as a series of shock results saw Nottingham Forest secure second spot and edge out Doncaster Rovers and Carlisle United, who trailed them by two points, while Leeds leap-frogged Southend on goal average to take fifth place and a play-off against fourth placed Carlisle. McAllister had lost only three games since taking over, drawing five and winning an impressive nine times in his seventeen games in charge. He quickly added another loss as United went down 2-1 at home to Carlisle in the first play-off semi-final, scoring their goal in the final seconds. Against all the odds United went to Carlisle, who had won seventeen and drawn three of their twenty-three home League games and took an early lead before putting the game beyond doubt in injury-time. Unfortunately they could not repeat their performance in the Final with Doncaster Rovers at Wembley and lost 1-0. McAllister continued to lead United on in 2008-09 and maintained his 63% success rate initially. After a reasonable start United's fortunes took a dip and after losing their fifth game in succession, by 3-1 to fellow promotion aspirants Milton Keynes Dons, on 20th December 2008 was sacked as Manager. The former Scotland international had only accepted a new, twelve-month rolling contract in April, but Ken Bates, the club�s chairman, decided to take action over Leeds� recent dip in form, they were fifteen points behind League leaders Leicester and five points outside a play-off position. The club, were ninth in the table, explained that the decision to part company with McAllister was made so that the new Manager might be allowed the time to turn around the club�s fortunes, and make the most of the transfer window in January. "The board took the decision following the recent poor run that has seen the club slip to ninth in League One," said a statement posted on Leeds� website. "The decision was made to ensure that the new Manager, when appointed, has the maximum number of games possible to move the club up the table. "And also before the transfer window opens in January to allow him to identify any new players he thinks can strengthen the current squad." However, Saturday's defeat was their fourth successive loss in the League, after being knocked out of the FA Cup by non-League Histon the previous month. The decision was unlikely to have come as much of a surprise for McAllister. He had likened his repeated explanations of his side�s lack of form to a broken record after the MK Dons defeat that weekend, and described their mistakes as �undefendable�. �I must sound like an LP record at the moment that is spinning round and round, playing itself over and over again,� he said. �I am disappointed for Leeds United and the club�s supporters. They are as impatient as I am but I can sleep at night because I am giving 100 per cent.� McAllister, who was about to celebrate his forty-fourth birthday on Christmas Day, had been in the position for less than a year, having been appointed in January. His record was played fifty, won twenty-five, drawn eight and lost seventeen. After leaving Leeds he tried for the Manager's position with his home-town team, Motherwell, and had talks about becoming an assistant coach for the Scottish National Team but on 25th September 2009, he rejected the position. Four days later he was in line for the Assistant to Manager Paul Hart at Portsmouth, but terms could not be agreed. On 20th May 2010 he joined Middlesbrough as Gordon Strachan's Assistant Manager. 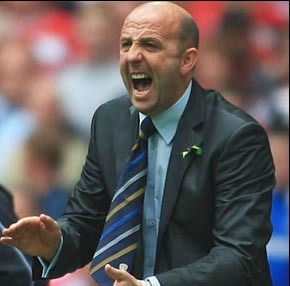 On 18th September 2010 McAllister was appointed Assistant Manager to Gerard Houllier at Aston Villa and after the Frenchman was hospitalized he became Manager on 23rd April 2011 for the home 1-1 draw with Stoke City, until the end of the season, which included two fine victories by 2-1 at Arsenal and 1-0 at home to Liverpool. On 17th June 2011, Alex McLeish was appointed Villa Manager and McAllister exited Villa Park. He became the Liverpool first team coach in July 2015 but lost his position after the removal of Brendan Rogers as chief coach on 8th October 2015. However, he was appointed as an ambassador for the club, a position he retained until after Steven Gerrard was apponted as Manager of Glasgow Rangers on 4th May 2018 and McAllister became his assistant.